Having just returned from Disneyland, Bobby has been smiling from ear to ear since we got back. I’ll never know if the grin is from meeting who Bobby calls “Mickey the Mouse”, all of the sugar he ate, or Tinkerbell’s fairydust. One thing I do know is that we will be going back to the Magic Kingdom! This article is organized in two parts – first is all about visiting the park with kids, and then the logistics of getting and staying there (discounts too!). To be honest, I was a little unsure about toddler friendly Disneyland would be – how would Bobby do in line, would he like the dark rides, would he be able to spend the day without a nap, how would diaper changes go. To be even more honest, I was pleasantly surprised by the experience. After all Disneyland has been open since 1955, so it has perfected the art of entertaining kids and adults alike. For Starters, it was amazing to experience Disneyland as a parent. Swapping roller coasters like Big Thunder Mountain Railroad and Space Mountain for Flying Dumbos and Storybook Boats offered a completely different (and better) experience. Having read my share of reviews prior to taking Bobby on the rides, I learned that the rides can be scary (even dangerous for some kids with seizure disorders) mainly because of the dark and the lighting used. So, my plan was to ease him into the experience. We started off with outdoor rides like Flying Dumbos, Rockets, Storybook Boats, Jungle Cruise, Circus Train. He loved them all. The Dumbos were his favorite! We then began to test the indoor rides. We started with Alice in Wonderland – which he loved! We then found Winnie the Pooh (which had no line) which was darling. Bobby enjoyed it so much that we went on it a couple of times. We then tried Small World and Peter Pan, both were hits. So, we did a few more of the darker rides Pinnochio, Buzz Lightyear’s Space Invaders and Snow White (which is the only ride I don’t recommend). He liked these rides, especially the Buzz Lightyear ride as he was able to play with a gun that lit up when he pulled the trigger. Snow White and walking through Sleeping Beauty’s Castle are the only two attractions I don’t recommend for tots. These were the only things that Bobby didn’t like. (we didn’t get to try the Haunted Mansion or Pirates as both were closed – so I can’t speak about those rides). The shows were another favorite. Bobby loved the singing birds in the Tiki Room and I loved the air conditioning! We also checked out the Parade, which seemed to be a favorite for tots sitting around us. Although it was a little overwhelming for Bobby – so I recommend grabbing a seat somewhere that provides a quick exit if necessary. If you want to do the parade thing, make sure to claim your spot about 30 minutes before it starts. We sat across from the teacups and the lanterns that hang above the teacups were a lovely backdrop for a nighttime parade. Playgrounds – Tom Sawyer’s Island. Bobby loved exploring the caves. Though a word of warning to pregnant moms – it can be a bit tricky to navigate through the narrow passage ways, so I recommend bringing backup with you. Toon Town is full of places for tots to explore. With houses (on land and in a tree), a boat, and even a playground (Goofy’s backyard), tots are sure to have fun. Bobby loved running around in Mickey’s house. He got to play with Mickey’s phone, TV, and in Mickey’s garden. To top it all off, Bobby even met Mickey! Visiting with Characters – There were lines to visit with characters in the park. For this reason, I recommend not waisting time in these lines, rather I recommend booking a meal at a restaurant that does character dining. There are a few options and depending on your child’s favorite character you can pick a spot. For example, Goofy makes appearances at his kitchen in the Disneyland Hotel, Mickey hosts a breakfast at Disney’s PCH Grill at the Paradise Pier Hotel, and Minnie has a breakfast in the Park at the Plaza Inn. Dining reservations can be made in advance by calling Disney Dining at (714) 781-3463. We went to Goofy’s Kitchen for an early breakfast before the park opened. 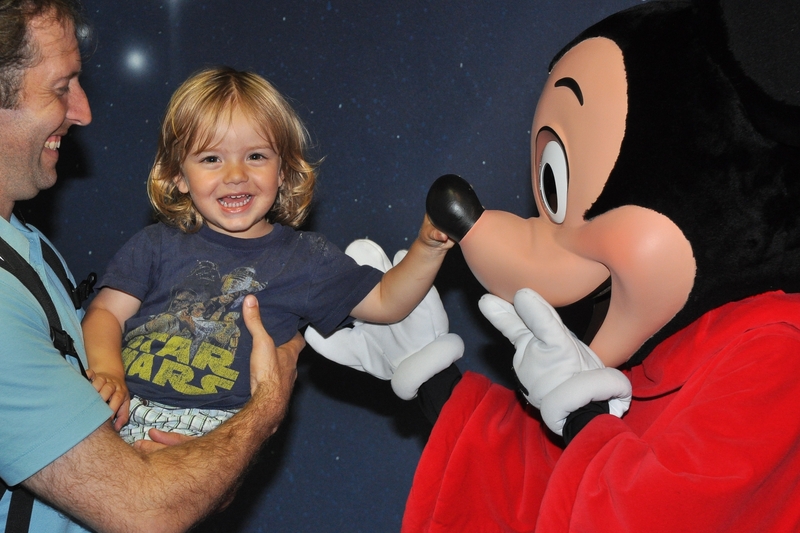 Bobby loved meeting and playing with Chip, Dale, Goofy, Blaou and Pluto. Snow White and Mulan also visited our table, but unfortunately Bobby isn’t into princesses. Next time, we are going to catch Mickey at the PCH Grill. The Park has plenty of things to do when you are super tired. Try taking a cruise on the Riverboat, seeing a show, catching a train around the park, or sitting for a meal. For young train lovers, the patio at Rancho del Zocalo has a view of Big Thunder Railroad. Let the kids watch the trains pass by as they enjoy a quesadilla. For folksy music lovers, the Big Thunder Ranch BBQ has a show and lots of yummy all you can eat BBQ. Another option for tired parents with wired (i mean tired) toddlers is to catch a show. The Tiki Room, Mickey’s Cartoons on Main Street, Abe Lincoln Speech, and Captain Eo are a few options. For parents with older kids aged 4 to 12, the Jedi Training Academy is awesome. This interactive show/workshop lets kids dress up as Jedi and swing around light sabers while parents relax and watch their budding Jedi’s pick up some tricks. In fact, my husband was a little bummed adults couldn’t participate. Of course in addition to having fun a trip to Disneyland is also about the photos. The Park has a few classic backdrops for photos. When you first walk in by the flowers, in front of Sleeping Beauty’s Castle. There are more kid like backgrounds in Toon Town. And, I recommend taking photos in the character houses in Toon Town as they come out great! Disney will also take professional photos of you and with your camera with Mickey at his house in ToonTown. For parents with kids who have epilepsy or other seizure disorders, there are other things to consider. The lights in the dark rides can trigger episodes. So, talking to your child’s neurologist can help you have an action plan. In addition, pregnant moms will want to check to see rides that are not pregnancy friendly. For example, rides that jerk like the roller coasters and Mr. Toad’s wild ride, Autotopia aren’t recommended. Disneyland is great about having warnings on the rides. So if your child wants to do these rides, have backup ready to take them on it. Tony was a trooper and took Bobby on Autotopia. Staying at one of the Disneyland hotels would have had advantages. Guests are able to enter the park an hour early – and take a train into the park. Now that Disneyland is on winter hours (it opens at 10), the extra hour would have been nice for Bobby. However, the Disneyland hotel was a bit out of our budget for this trip. So, we checked out a hotel within walking distance from the entrance. There are quite a few hotels literally within steps from the entrance gate to Disneyland (and geographically closer to the park than the Disneyland hotel). If you are just looking for a place to crash, I would check out one of these hotels on South Harbor Blvd. Make sure to check out the reviews online before booking one of these hotels. We stayed at the Ramada Inn Maingate which was completely adequate though by no means as nice as the Disneyland hotels (bathrooms were clean, but carpets were sketchy). The price included free parking and a continental breakfast. The staff is also honest as we left Bobby’s quilt there and they found and returned it to us. If you have time driving down from Sonoma is a pretty easy. Weather permitting, pack a lunch and stop at a rest stop half way. If it is too hot or rainy, you can stop halfway at Harris Ranch and have some burgers. Disney offers discounts on tickets and vacation packages. At different times of the year, they will run discounts on hotel stays too! So, be sure to check out – www.disneyland.com/offers. Other discount options are available at websites like mousesavers.com. This entry was posted in Uncategorized on October 25, 2011 by Modern Mama. Love it!!! Great info. I’m so glad I know modern mama Mary!!! I can’t wait to go!!! This couldn’t have been more perfectly timed! We leave for Disneyland on Wednesday and I needed some tips like this. Great post. Thanks! Oh good!! I hope you have a great trip!